As satellite images of wildfire smoke and local air quality data streamed into our labs last month, the implications of our science have never felt so immediate. The thick haze of toxic wildfire smoke created levels of particulate matter that are the worst in over two decades for the Puget Sound region. In a lab meeting on a record-breaking pollution day, a colleague described a sinking feeling in her gut when she saw a group of children at summer camp playing outside in the smoke, since wildfire smoke can be especially dangerous for kids. The bike crossings counter on the Fremont Bridge indicated that 60% of cyclists paid no heed to the pollution warning and biked to work anyways. Since Seattle has not historically been affected by wildfire smoke, many people are unaware of the risks that summertime activities like biking and playing outside have on our health when the air is heavy with particulate matter. During the peak in wildfire smoke, the Seattle Times informed readers of ways to stay safe by closing windows, staying indoors, and keeping indoor air clean. These protective measures are important: a recent study from researchers at Colorado State University (including PCC alum Dr. Emily Fischer) indicated that wildfire smoke exposure may cause thousands of premature deaths nationwide each year, and the number could potentially triple in our children’s lifetimes. Although there are numerous causes of wildfires — many are started by humans, and made worse by decades of fire suppression — the scientific evidence overwhelmingly suggests that climate change, causing less winter snowpack and hotter, drier summers, is making them worse. Warmer winters also increase infestations of Pine Bark Beetle which kill thousands of trees every year, further fueling wildfires. We can expect smoky skies like we’ve seen this summer to become more common in the future. 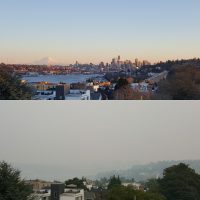 Photos by Hannah Horowitz capturing Seattle’s iconic Mount Rainier in the distance on a clear day, and a photo taken August 20, 2018 when Western Washington residents and beyond struggled with hazardous air quality conditions largely due to wildfires in British Columbia and Eastern Washington. Given the unprecedented severity of last months’ poor air quality and the likelihood that this will continue, we need a robust response plan to protect the health of vulnerable populations such as seniors, children, outdoor workers, and those experiencing homelessness from wildfire smoke exposure in our city. Government agencies, researchers and community organizations in Washington are already taking action with limited resources to protect public health from wildfire smoke. The Puget Sound Clean Air Agency provides excellent air quality forecasts and warnings. 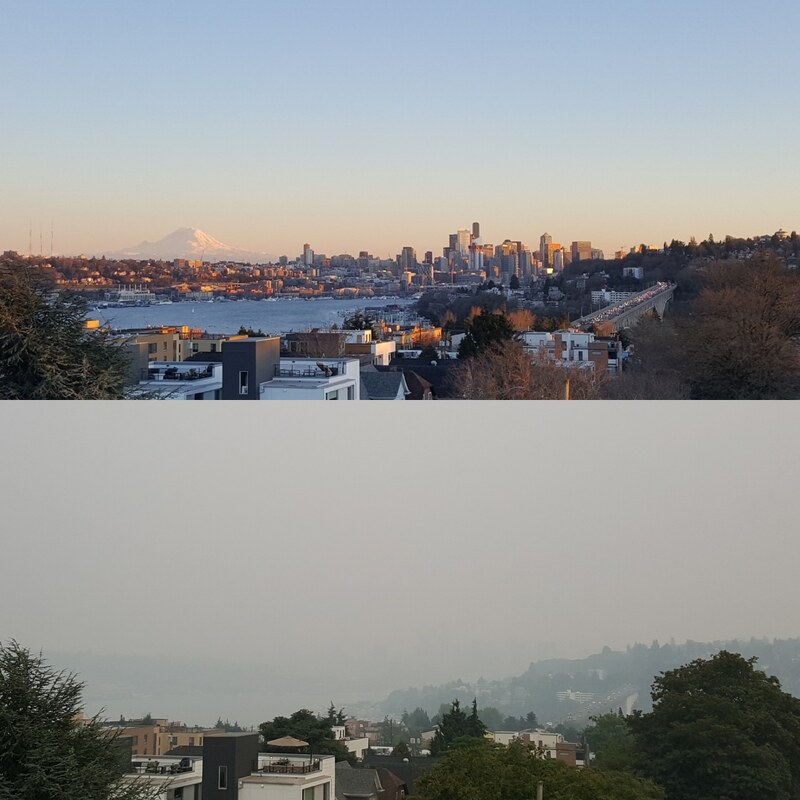 On the local level, Public Health Seattle-King County provides information about wildfire smoke which is especially relevant to sensitive groups like children, pregnant women, people with lung diseases or heart problems, older adults, smokers or diabetics. Local health departments in Eastern Washington, where wildfire smoke intrusions are even more severe, are collaborating with community partners to help people stay safe. On the state level, Department of Health and are working to better understand and address the health risks of wildfire smoke. But in addition to a robust public health response plan, we also need a holistic prevention strategy that includes a sharp reduction in carbon pollution. The recent roll back of vehicle emissions standards and opening of new public lands for oil and gas exploration means US emissions of heat-trapping gases like carbon dioxide and methane will continue to rise in the near future. This will further exacerbate climate change, increasing wildfires and other public health hazards. Absent national leadership on this crisis, local and statewide efforts to reduce air pollution and carbon emissions are taking the lead. In Seattle, where most of our emissions comes from transportation, civic groups have won low income fares to promote public transit. In November Washington voters will decide whether to be the first state in the nation put a price on carbon through citizens initiative 1631. As we continue to see the social costs of pollution born disproportionately on the most vulnerable among us, these efforts and decisions are critically important.